I have mentioned before that the idea of UFOs and aliens uneases me terribly. I think having any kind of encounter would just ruin me in multiple ways! 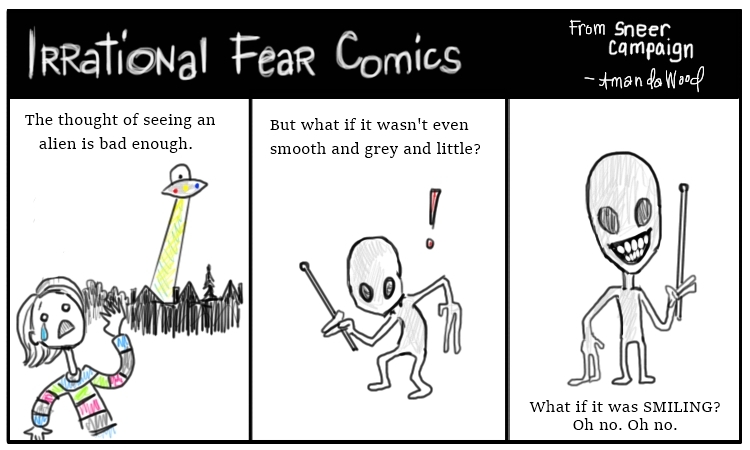 But I had always imagined them as being the “grey” aliens that seem to be popular depictions. It’s not that I sat around believing these people on Sightings and other things who were describing their horrifying abductions which often just sound like repressed memories of the more earthly sorts of molestation (but I am not here to point fingers or make rational speculations). However, I never got around to imagining the variety of alien life forms that could sneak into my home at night to steal me away. Grey Alien is ENOUGH. Then cchris sent me a link to this horrible story about this woman who pretty much had a bad dream but she thinks it really happened. That is what I choose to 100% believe about this thing. It did NOT happen. But I cannot ever forget the image in my mind of a grey alien “trying to smile.” I mean, good job whichever alien thought up the brilliant idea of ,”hey, maybe if we put smiles on our giant heads, it will make the earthlings not afraid?” However, THIS earthling is like a hundred times more afraid now. Back to the drawing board. On your planet. A zillion light years away. Leave me alone!